The orbital maneuvers of a mysterious object Russia launched earlier this year have raised concerns that the satellite may be a space weapon of some sort. The speculation centers on "Object 2014-28E," which Russia lofted along with three military communications satellites in May. 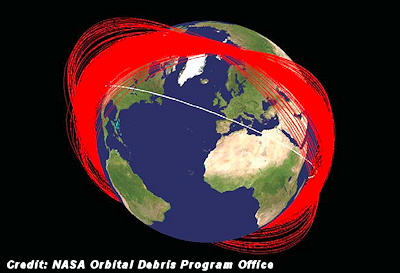 The object was originally thought to be space junk, but satellite trackers have watched it perform a number of interesting maneuvers over the past few weeks, the Financial Times reported Monday (Nov. 17). Last weekend, for example, 2014-28E apparently met up with the remnants of a rocket stage that helped the object reach orbit. As a result, some space analysts wonder if Object 2014-28E could be part of an anti-satellite program — perhaps a revived version of the Cold War-era "Istrebitel Sputnikov" ("satellite killer") project, which Russian officials have said was retired when the Soviet Union collapsed in the early 1990s. . . .